Victoria University Emeritus Professor Phil Garnock-Jones and I have just described a new species of native plantain, Plantago udicola. The name udicola means “dwelling or living in damp places” and is in reference to the types of sites the new species is usually found in. The new species, Plantago udicola from Lake Sylvester (WELT SP090375/A). Photo copyright Mei Lin Tay. 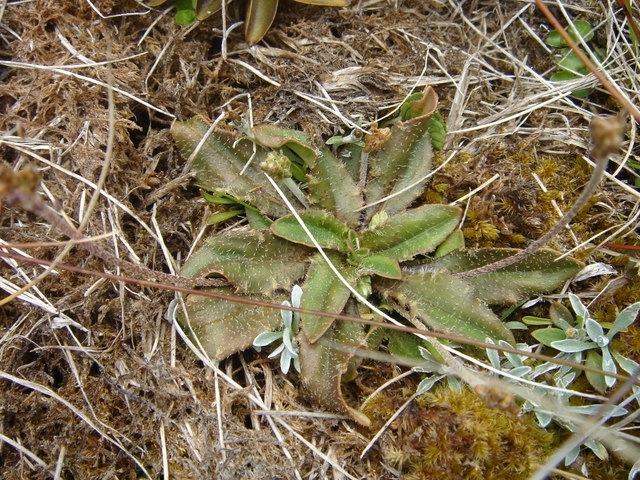 Of the 200 or so species of Plantago worldwide, there are about 20 species of Plantago in New Zealand. This includes a handful of non-native invasive species, several of which are common garden and roadside weeds, together with 11 native species. 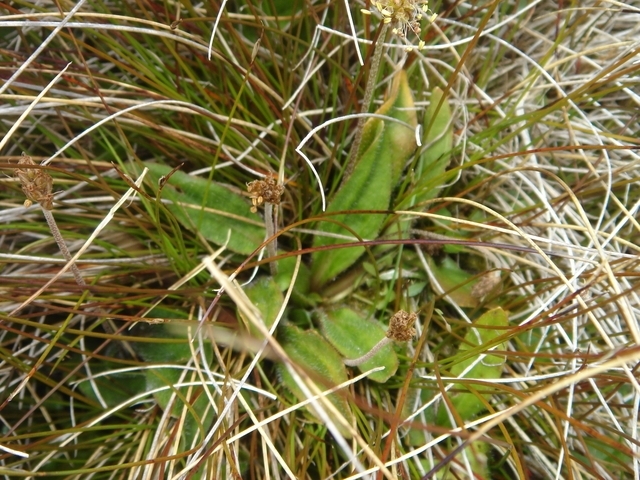 The new species Plantago udicola Meudt & Garn.-Jones is described in a recent paper that revises the taxonomy of all native New Zealand plantains. Abstract of the paper describing Plantago udicola. To determine whether Plantago udicola deserved species status (as well as to test the taxonomy of the other native species), I studied and compared specimens from our collection at Te Papa and other herbaria. Because native plantains are very small and have tiny, wind-pollinated flowers, this meant spending long hours at the dissecting microscope. I also took into consideration the plants’ chromosome numbers and habitats, as well as previously published DNA analyses. Plantago udicola looks similar to two other species of native plantains, Plantago raoulii and Plantago spathulata. Plantago raoulii is a common low-elevation plantain found in coastal and forest habitats throughout New Zealand. P. raoulii was even collected by Joseph Banks and Daniel Solander, the botanists aboard Captain Cook’s first voyage. Plantago spathulata is another lowland species but is restricted to coastal and inland areas of southeastern North Island and eastern South Island. See images of Plantago spathulata, Plantago raoulii, and other native Plantago here. Plantago udicola is distinguished from these two species by its different chromosome number (it has 96 chromosomes! 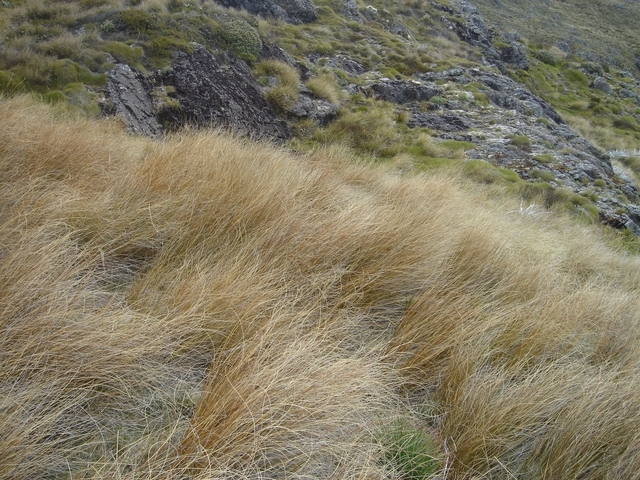 ), habitat (flushes in damp tussock and herb fields over 600 m elevation), and a unique suite of morphological characters, including up to four ellipsoid, uniform seeds, scapes with two different kinds of hairs, bracts with hairy margins, and sepals with hairs at the tip only. Habitat of Plantago udicola from Lake Sylvester (WELT SP090374/A). Photo copyright Mei Lin Tay. It may be that Plantago udicola is an allopolyploid of P. spathulata and P. raoulii (or their ancestors). In fact probable hybrids of P. spathulata x P. raoulii (each of which has 48 chromosomes) are similar morphologically to P. udicola. This hypothesis will need to be tested in future studies. 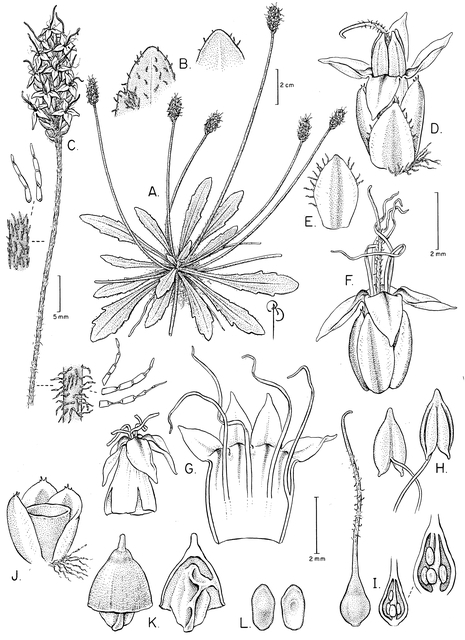 You can see many of the important traits that help separate Plantago udicola from the other 10 native New Zealand plantains in this botanical illustration by Bobbi Angell. Plantains in general are difficult to photograph, so we don’t yet have many photos of this new species. Botanical illustration is another (and more traditional) way to show the main characteristics of a plant at different stages in its life cycle. Botanical illustration of Plantago udicola. Copyright Bobbi Angell. Bobbi Angell also drew three other native Plantago species, and Te Papa houses these and several other of her illustrations. Find out more about the Bobbi Angell illustrations Te Papa holds. Even though Plantago udicola was only recently described, for half a century botanists have thought it was probably distinct. Interestingly, Te Papa botanists Leon Perrie and Pat Brownsey also described a new fern species earlier this year, which like P. udicola, was also suspected of being a new species for nearly 50 years. Both of these examples highlight the importance of our collections at Te Papa, and at other New Zealand and international herbaria, as a potentially rich source of new, as-yet-undescribed species. Wow, it’s not every day that happens. Well done guys !